This is the second year that East Carolina University has invited Eric Chavez Santiago to exhibit at the Youth Arts Festival in Greenville, NC. He will be demonstrating weaving and natural dyeing techniques, too. The exhibition and sale will be held on-campus all day on Saturday, April 5. Eric and Elsa packed the car this morning and are driving from Chapel Hill to Greenville, which will take a couple of hours. Tonight there is a special dinner for exhibitors and they are excited about attending. 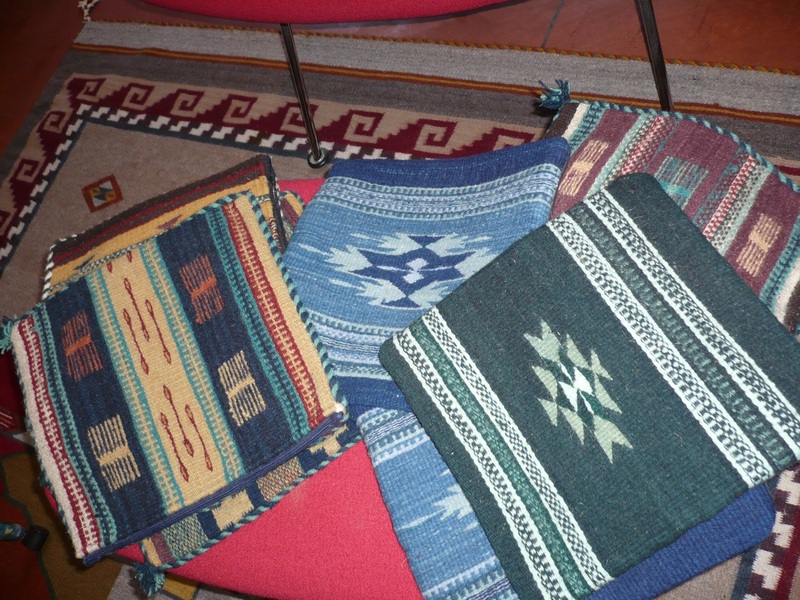 They are taking about 40 rugs with them and will offer these for sale, along with hand-loomed shawls, embroidered blouses, baskets woven with agave and palm leaves, handwoven and naturally dyed decorative pillows, and a few wonderful handbags. This entry was posted in Oaxaca Mexico art and culture, Oaxaca rug weaving and natural dyes and tagged Chavez Rug Exhibition East Carolina University, cochineal dye pot, Greenville, handwoven pillow covers, NC, Youth Arts Festival North Carolina. Bookmark the permalink.